You have to excuse the loss of Fabergé Friday last week. I was performing in the International Stockholm Burlesque Festival that day. So, well, I was a bit busy getting my striptease on... But here we go again, and today I have a pine tree for you. It was made around the year 1908! 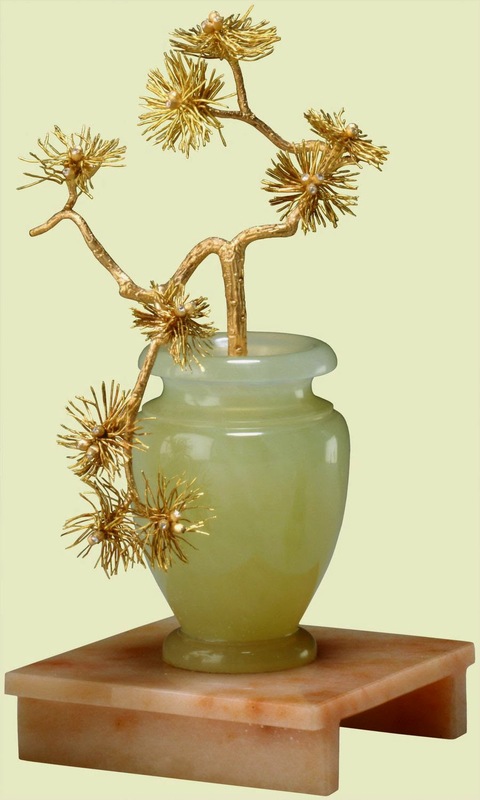 The gold pine tree sits in a pot carved from bowenite on a platform of aventurine quartz. Amidst the pine needles sits little brilliant-cut diamonds. This botanical study is said to have been modelled from life at Sandringham, perhaps in 1907 when Fabergé's sculptors were there working on a commission for animal portrait models for King Edward VII. In 1908 the Prince of Wales, later King George V, bought this plant from Fabergé's London branch. It can now be found in the Royal Collection.